After trimming West Indies 3-0 in the T20 series, the Indian team will now depart for Australia. 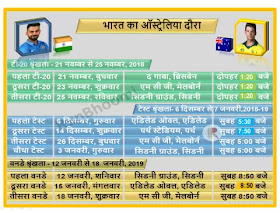 India’s tour of Australia begins on November 21. 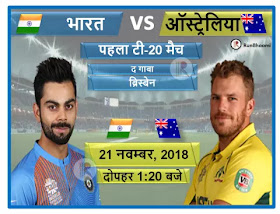 On 21st November, the first match of the 3-match T-20 series between India and Australia will be played at Brisbane from 1:20 pm. All matches will be broadcast live on the India tour of India on Sony Six, Sony Ten and Sony Live App. The first match of the 3-match T-20 series between India and Australia will be held on November 21 in Brisbane, the second T20 match will be held on November 23 in Melbourne and the third match will be held on 25 November in Sydney. All these matches will start from 1:20 pm. After the T-20 Series, India and Australia will play 4 Test matches between December 6 and 7. 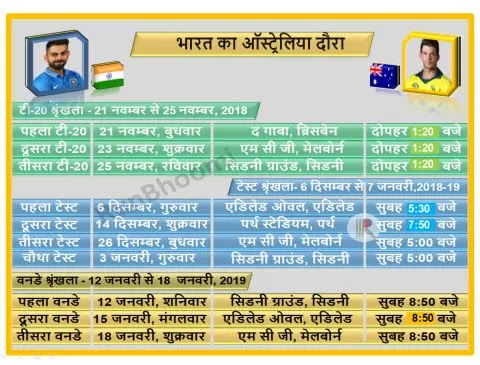 The end of this tour will be on 3 January, 2019 with 3 ODIs.